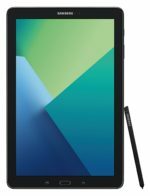 Below you will find our picks and reviews for the best 9-inch to 10-inch tablets (technically 8.5″ – 10.4″) including models with Android, iOS, and Windows operating systems. At the bottom of this article we also provide a spec comparison chart to you can easily compare one tablet versus another. If you are looking for a tablet with a bigger display than those of the 7 and 8 inch versions, then those with 9 to 10 inch screens might be perfect for you. These models handle all the same tasks like browsing the web, playing games, using apps, and consuming media, but make it a much more enjoyable viewing experience without straining your eyes. These larger varieties also make working on a tablet much easier as well. There are also even larger tablets (from 10.5 inches to 13.4 inches) available if interested. Some of the disadvantages compared to the smaller devices include: more expensive, heavier to hold for long periods of time, and not quite as portable – although still more portable than a laptop. Prices for the larger tablets range from about $125 up to $700. Buyers should note that the prices we list are for the cheapest option of that model available – you will have to pay more for things like more storage or cellular 4G data. Again there are a lot of options depending on if you want a cheap budget tablet or want one with a beautiful display and top-tier performance. One spec you might really look for is pixels per inch, or PPI, which tells how good your display will look – the higher the better. 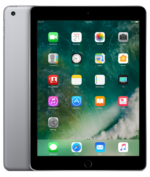 The new 2018 version of the Apple iPad 9.7 is the best value iPad ever made by Apple with a starting price of just $329.99. The combination of price versus the performance and screen quality makes this the best 10-inch tablet you can buy. The latest generation of the Apple iPad 9.7 doesn’t change a whole lot from the previous generation, but it does feature a better processor and supports the Apple pencil. It also has long battery life of over 10 hours on average. If you want to buy an iPad or 10 inch tablet then you really can’t go wrong with the new 6th generation Apple iPad 9.7. 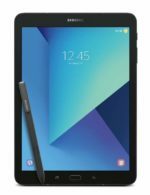 The Samsung Galaxy Tab S3 9.7 is our pick for the best Android 10 inch tablet. This super thin and light device sells for about $443. The Galaxy Tab S3 has a simply stunning HDR capable AMOLED screen, a capable S Pen stylus, and pretty good quad speakers. Watching videos on this slate is simply a pure joy. It also has improved battery life over the Galaxy Tab S2 with about 10.5 hours of average use. Although older than the newer Galaxy Tab S3, the $365 Samsung Galaxy Tab S2 9.7 is the thinnest and lightest 10-inch tablet you can buy and still ranks really high on our list. It has a brilliantly beautiful AMOLED display which also happens to be the brightest one available. The performance is outstanding, however, the one main drawback is its battery life that averages under 7 hours. This version (T813) of the Galaxy Tab S2 is an updated version and comes with a better processor and newer Android operating system. The Microsoft Surface Go represents Microsoft’s version of a 10-inch Windows 10 2-in-1 convertible tablet / mini-laptop. With a starting price of $399 this is pretty good budget 2-in-1, in fact it would be hard to find a Windows 10 laptop that performs this well for cheaper. The performance of the Microsoft Surface Go is decent enough, although far from outstanding, while the screen has less pixels-per-inch than most of the devices on this list. The battery life is not very good at just under 8 hours on average, with one test coming in at 6 hours of mixed use. Overall if you are looking for a 10-inch Windows 10 device then the Surface Go is a great choice. Buyers should be aware the keyboard is sold separately. If you are just a casual user who doesn’t need a Windows 10 device for productivity, then there are better, cheaper options available. 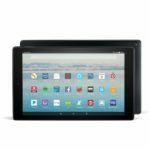 As one of the cheapest 10-inch tablets available, the Amazon Fire HD 10 is a good choice for anyone looking for a budget 10-inch tablet. With a price of just $150 the Fire HD 10 is vastly improved over the previous generation. It has the best screen on any Fire tablet – a 10.1-inch display with a resolution of 1920 x 1200 pixels and 224 ppi. Performance wise it is just average and forget about using the cameras – they are not good. Battery life is about average with over 9 hours of use on average. It also does not support Google apps. Overall if you belong to Amazon Prime and just want a tablet primarily to view shows and movies then you really can’t go wrong with the Amazon Fire HD 10. Surprisingly vivid display, strong battery life, and a USB Type C port are all highlights on the $279.99 Lenovo Tab 4 10 Plus. This 10.1-inch Android tablet comes with just 16 GB of storage in the cheapest configuration, but you can pay more for the 64 GB version. While the general performance is okay, on the downside, the graphics performance is below average. The Lenovo Yoga Tab 3 Pro packs a lot of great features into a 10-inch device that costs about $400. Maybe the most impressive feature is the long battery life of over 12 hours on average. The performance is also plenty fast with 4 GB of RAM and 64 GB of storage. This Yoga’s most interesting feature, however, is the pico projector built into the cylindrical spine. The projector won’t wow you, but is still an excellent addition that you don’t find on any other tablets. The screen also is quite bright and sharp at 10.1 inches and 302 ppi. One downside is that it is a bit heavier than other models at 1.47 pounds, while the cylindrical spine makes it much thicker as well. 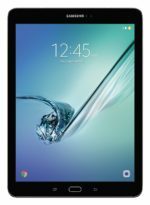 If you want a cheaper Samsung 10-inch tablet then the $229 then the Samsung Galaxy Tab A 10.1 is for you. The components are not as good as other Samsung devices on this list, although the performance is still adequate for most everything. One advantage it does have is long battery life. At 13.2 hours on average in real world mixed-use tests the Samsung Galaxy Tab A 10.1 will last nearly twice as long as the Galaxy Tab S2. You also get an S Pen stylus with this device. With a price of $297.99 the Asus ZenPad 3S 10 has the best screen of the best 10-inch tablets under $300. Watching videos is a joy on its clear 9.7-inch display with a resolution of 2048 x 1536 pixels and 266 ppi. The performance is decent, although large games can take a while to load. The Asus ZenPad 3S 10 also has a fingerprint scanner for extra security that you don’t find on other models in this price range. Overall the Asus ZenPad 3S 10 is a great choice for anyone looking for an affordable 10-inch tablet. The cheapest 10-inch tablet to make our top 10 list is the $145 Lenovo Tab 4 10. With a screen resolution of 1280 x 800 and 149 ppi, the display leaves us wanting more. The performance is passable, but below average – especially in terms of 3D graphics. On the plus side the battery life is quite good for this price at about 10.5 hours on average. If you want a cheap 10-inch Android tablet then you should seriously consider the Lenovo Tab 4 10. Compare tablets from 8.5 inches to 10.4 inches.